One of the popular ways for private companies to obtain a listing status on the Canadian Stock Exchange (“CSE”) is through a reverse takeover (“RTO”) with an existing listed entity. The most common version of an RTO is when a private operating entity merges with a listed (more or less) shell corporation, effected by way of exchange of equity interests, which typically results in owners of the private entity gaining control of the combined entity after the transaction. Understanding how the financial records of the resulting combined entity shape up is an essential factor for the leadership of the private entity to gauge the breadth of such a transaction. It is however often overlooked amidst other regulatory requirements. The International Financial Reporting Standards (“IFRS”) and its interpretation, provides specific guidance around this area, which is the subject of this piece. Despite the public shell corporation issuing shares, from an accounting perspective these transactions are considered to be capital transactions of the private entity looking to obtain the listing status of the non-operating shell corporation. They are therefore equivalent to the issuance of shares by the private entity to acquire the net assets of the public shell corporation. Unlike a straight acquisition achieved through exchange of equity interests, where the accounting records are a continuation of the entity issuing shares, in an RTO, the historical financial records of the private entity are retained. The RTO is accomplished by recognizing, in the financial statements of the private entity, the net assets of the publicly listed shell corporation in return for shares “deemed” to be issued by the private entity to obtain a control position in the combined entity. The equity structure however, (that is, the number and the type of equity instruments issued) of the combined entity, reflects the equity structure of the publicly listed shell corporation, including the equity instruments exchanged in the RTO. The deemed shares issued by the private entity, which is the consideration it has paid for the acquisition of the public shell corporation, are recognized at fair value and any difference between the fair value of these deemed shares and the fair value of the acquired net assets of the public shell corporation, represents a cost to the private entity. The Interpretation Committee of the IFRS points out that, for the private entity, this difference in fair values is considered to be a payment for service of a stock exchange listing for its shares, and therefore should be expensed through its profit or loss. This is in contrast to the usual treatment of cost of issuing capital, which reduces the value of the capital raised. The leadership of the private entity therefore needs to understand this and evaluate if this is an acceptable impact on their financial reporting. Although this is a simplistic introduction of what to expect if you choose to obtain a listing on a stock exchange by way of an RTO with a listed shell corporation, accounting for such acquisitions can be quite complex. This could include determining the fair value of the consideration for the transaction (i.e. the value of the deemed shares issued by the private entity), the fair value of the net assets of the public shell corporation, non-controlling interest considerations, earnings per share calculations, to name just a few. The key thought is to ensure to involve your accounting advisors, amid other consultants, at the right time in the whole process so you have a complete picture of the impact of your desired transaction. 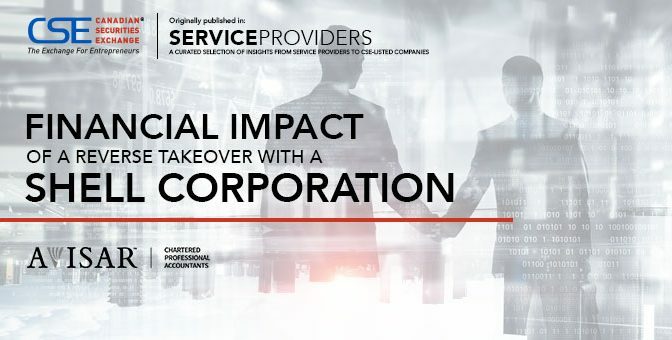 This story was featured in Service Providers magazine. Learn more about Avisar at http://avisar.ca/ and on the CSE website at http://thecse.com/en/services/services-for-listed-companies/avisar.